Last week, Part 1 of this article explored the history of South Korea’s rise as a global cultural force, and the attendant soft power benefits that country has enjoyed. These benefits include disproportionate global influence for Korea relative to its size, and enhanced respect among its neighboring countries, including China. Here we’ll take a look at the paradox of why China, despite having 30 times the population of South Korea and very similar cultural “DNA,” has failed in its efforts to achieve the global cultural influence it craves. While China has invested heavily in hard assets for cultural production—soundstages, production equipment, post facilities, and the like—it has never placed much stock in the value of soft assets, that is, the unquantifiable human skills and experience that are the lifeblood of creativity. Few Chinese investors understand or respect the vital importance of the creative spark, and as a consequence they don’t reward it. Film and TV projects are treated as industrial enterprises that require the firm hand of a dictatorial director. There is precious little support for training and development in the fields of screenwriting, songwriting, and other ‘intangible’ arts, and so China’s talent pool in these areas is extremely shallow. The story-telling styles promoted by China’s central government don’t lend themselves well to the creation of globally commercial, crowd-pleasing hits. The Chinese Communist Party’s historical emphasis on the collective over the individual has for decades rewarded stories about group achievement. Most favored are those plots about individuals who subordinate their desires and conform their behavior for the common benefit of the people. Ensemble stories that have no single identifiable hero are common. Unfortunately for China, the stories that are most popular around the world tend to be those that are precisely the opposite, ones that draw from the American mythos about maverick individuals who buck the system and flout the rules in order to succeed. Censorship, as we’ve noted here before, is a major obstacle to China’s pop culture success, but censorship in and of itself is only part of the problem. After all, China’s current censorship rules are not all that different from the old Hays Code restrictions that governed Hollywood movie production from the 1930s through the 1960s, a period during which Hollywood achieved many of its greatest artistic and commercial achievements. China’s bigger issue is the arbitrariness of its rules and the mercurial, sometimes bizarre nature of their enforcement. Censorship was just as politically motivated in old Hollywood as it is in modern day China, but there is a crucial difference: under the Hays Code rules, filmmakers were pretty much free to operate within the constraints that had been laid down, and creativity was allowed to flourish so long as one played by the rules. But in China, the specter of government interference haunts every step of the creative process, burdening the artist like a set of heavy chains that continually saps their strength. Chinese censorship is a government tool for controlling the people, their thoughts and their impulses, and when applied to pop culture it unfortunately tends to squeeze every last original idea, every recognizable human truth, from the fabric of the content. China’s educational system also discourages idiosyncratic expression, and generally aims to stamp out ‘undesirable’ creative tendencies at the earliest ages. The Confucian philosophies that have guided Chinese society for many centuries put a premium on obedience to authority and strict adherence to elaborate rules of behavior. Anyone who dares to be different is swiftly put in their place. In the Confucian construct, artists and performers are at the lowest level of the social hierarchy, a rung or two below beggars and prostitutes. China surely has at least its share of the world’s creative talent, but most of it goes unrecognized because the system requires its suppression. Despite all these challenges—and doubtless additional ones that I’ve failed to consider—China’s prospects for exporting its culture and gaining soft power influence needn’t be so bleak. It wasn’t long ago that South Korea faced all these same challenges and more. In Part 3 of this article we’ll take a look at the specific and very deliberate actions Korea took to support its culture industries that led to the “Korean Wave”, and the lessons that China can draw from Korea’s experience. This entry was posted in Opinion and tagged Chinese censorship, hanryu, Hays Code, 한류, South Korean pop culture by chinafilmbiz. Bookmark the permalink. Very well written and analyzed. Thank you Jessi, nice of you to say! Korean films and TV have become prominent through pure excellence. Also, in many productions (Dae Jang Geum for example) the English subtitle work is superb, making it very watchable even if one does not understand Korean. Imagination is Korean film is sometimes quite amazing, “The Good, The Bad, and the Weird” being a prime example. A long exposure to both Japanese and American film has also had a great influence.My own collection has many Korean films made under Japanese occupation that are very good.The primary plot motive for most Korean work is vengeance, plain and simple.The Chinese do make very good films based on individual struggle, “Assembly” being a fine example. Lou, thanks for making some pertinent points. I’m also often struck by how imaginative and original Korean stories can be– they often make American entertainment look bland in comparison. As for films about individual struggle, it’s true that there are some fine Chinese films in that ‘genre’, if I can call it that (The Story of Qiu Ju is one my all-time favorites), but they’re not so common and they’re not so enthusiastically supported by the communist regime. An interesting discussion – and one which was briefly touched on in a discussion between a German Film Director (who makes documentaries in China for the West) and a Chinese Film reviewer on CCTV earlier today. Korean filmmakers apparently received their “soft skills” and built capacity in Hollywood – then came back home to tell Korean stories. The wider question being discussed was whether opening up Chinese cinema screens to an invasion from Hollywood – would be good for China in the long run. The influx of films from Hollywood apparently killed off German cinema in the 50’s and they have had to struggle to gain back less than 20% of their market share. I don’t know about German cinema – but I guess the same would be said of British cinema. The consensus seemed to be that some level of protection would be necessary but also that the competition from Hollywood will ultimately be good for Chinese cinema. 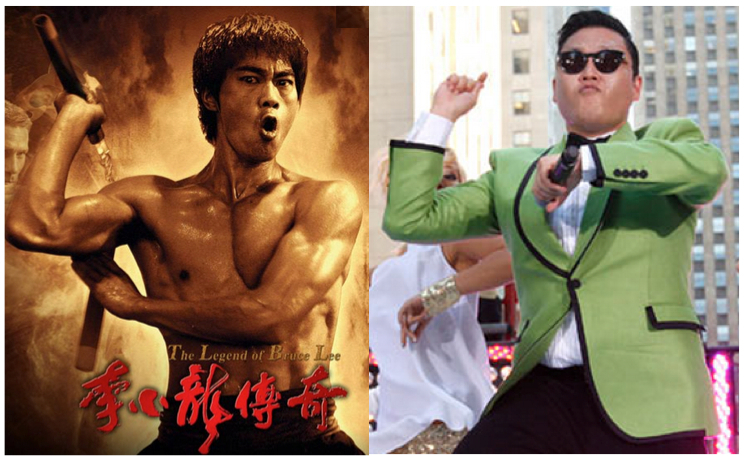 The contrasts / similarities between China’s film industry which has invested heavily in the infrastructure of the industry while failing to recognize the importance of artistic creativity and the soft skills that are crucial to tell stories that people want to watch – and Nigeria’s Nollywood – which has grown into a global phenomenon as possibly the most prolific industry in the world – with no incentives from government, (and only the most basic equipment to work with), is interesting. In the case of Nollywood – the “Mafia” that dictates the terms of engagement are the film distributors – who have been know to place a year long ban on a few actors and actresses for getting too big for their boots!! No one would cast them because their films would not have been marketed. In both cases – the result has been to stifle and stunt the development of potentially hugely lucrative film industries. Yetunde, thanks for your historical perspective and for the background on Nollywood. I don’t think there’s much danger of a Hollywood invasion on Chinese screens– the Chinese film bureaucrats are keeping a tight rein on the market.